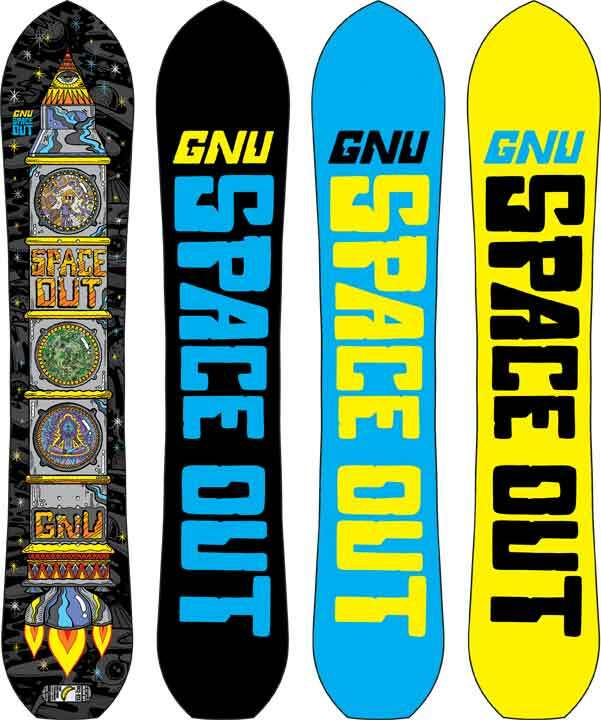 The Gnu Space Out takes a board we really like (the Space Case) and turns it into a tapered directional set back powder board. Both Peter and I had a good time with this board and it’s a perfect compliment to those that ride the space case but also want to surf powder. Not much has changed from 2015-2016. Conditions: A little bit of powder and some messy groomers. On Snow Feel: So the Space Out has DC2 BTX which is pretty much set back C2 BTX/hybrid rocker. it’s got that same semi-stable feel as most C2 BTX boards from Gnu and a pretty surfy ride that still has a touch of double ender freestyle feel to it. So it’s first and foremost a set back surfy powder board but it’s not terrible landing switch or throwing it around like a freestyle board. Turn Initiation: Nice and quick edge to edge even though a 25.5 waist can be a little big for size 8 and 9 feet. Medium and wide radius turns are pretty fun. It’s the kind of board that can slash in and out of trees but also be really fun on a steep wide open face when it’s deep. It’s not a bad board for turning on groomers. Flex: Nice middle ground flex similar to the 156 Space Case that we spent a lot of time on. It’s not bad to butter off the tail. Edge Hold: The Space Out has the same mellow magnetraction that is on the Space Case which is perfect for riding in powder but also has enough grip for dealing with hard snow if you have to. Powder: The Space Out has float. It’s got an inch set back and it has outstanding directional float with the rocker. The 157 rode a lot bigger in the little bit of powder we had and I don’t think I’d ever be concerned about lack of float going out in 3 feet plus of powder with the 157 we rode. You can really surf the powder like you are surfing a short board in the water. It’s slashy snappy and quick. Carving: Eh not the best here but it holds on a carve if you focus the power of the turn more on the middle to back part of the board. It’s a little washy but definitely doable. Speed: This has all the speed you need for any type of powder riding but it’s not really a groomer bomber. Switch: It’s no space case but it’s much better than you would think for this shape board. It’s fine for landing switch on occasion or riding back to the chair on a groomer run to mix it up. Jumps: Nice springy snappy board for ollies and it really has nice pop off the tail. It’s really about launching off rocks and cliffs instead of spinning off park kickers. Jibbing: It’s really directional and not really a jib board but you can do it if you are dealing with mellow jibs. Pipe: Same kind of thing here as jibbing. It’s not a real good fit but it can be done if you are more into directional riding or just going up to slash a pipe wall. So all in all we had a really good time with the Space Out. I think all will like it and some might be incredibly stoked on it’s ride and feel in powder. It’s a very recommendable board. We try to get as many images of the Gnu Space Out, but forgive us if they're not all there.